There are many elements to a kitchen to make the room into a place where people can gather for food and conversation. 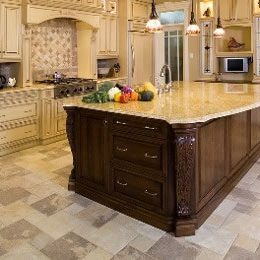 In addition to the appliances, cabinetry, and counters, there is the kitchen floor tile installation and backsplash tile installation to consider. The floor is perhaps the most used area in the kitchen but receives probably the least amount of consideration. 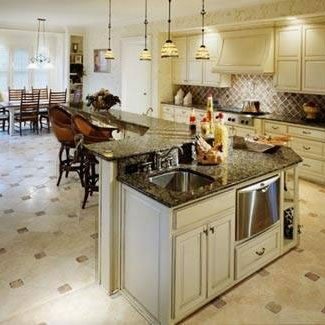 However, the floor of your kitchen is an important design consideration and can add value to your home. You want a floor that looks good but is also safe and will stand up to a lot of foot traffic over the years. When it comes to choosing the right floor tiles, you have many options available to you. You will also want to make the right choice with the right tile and pattern for your backsplash area to give your kitchen the “wow” factor. The pattern you select for your project is important. It can make a room seem smaller or larger so can the size of a tile. When I meet with you, I can make recommendations of the tile size and pattern that expresses your distinct individuality and style.